Message 68297 - Posted: 20 Mar 2019, 19:21:31 UTC - in response to Message 68290. I think better to just let it be as it is. As far i can see not much WU was affected before fix kick-in, so not big deal. Site works much better now! It was so SLOW and laggy before upgrade. Thanks for the feedback. I'm glad the site is running better for you. There were a lot of reasons we decided to upgrade, and the SLOW and laggy server was definitely one of them. We were running on 8 year old hardware and a pretty old version of the BOINC server. We are now almost caught up on BOINC server versions and running on brand new hardware. 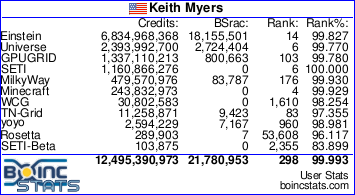 The only reason that we aren't running the newest BOINC server version is that is was released as I was building the new server software. Upgrading again in the future should be much easier now though. I agree, no big deal. Not worth opening a potential can of worms by altering something with the credit. Glad it got fixed fast and everything gets updated! Message 68318 - Posted: 21 Mar 2019, 3:24:43 UTC - in response to Message 68290. Not happy about it as what little I turn in for the project means the 40 tasks not credited will impact me more than someone who crunches full time for the project. But I agree just let it be so no more issues with the website and project can creep in. I see no need for fixing the 0credits wus. As always after a server upgrade anything can happen so we shpuld be carefull with the first WUs after an update and watch 'em closly. The amount of credits is lower. Either this is a reevaluation (people won't be happy) or it is another glitch to be corrected in the future. But in any case, make an official annoucement ! Message 68327 - Posted: 21 Mar 2019, 17:01:06 UTC - in response to Message 68290. Coming from Denmark and not participating full time I am doing it for fun, so credits doesn't mean that much to me. So I am happy with the new fix, but I do understand those who really put in some work are a bit sad. Thank you for the annoucement. It is now fixed. Message 68381 - Posted: 24 Mar 2019, 17:39:58 UTC - in response to Message 68290. Since the server change i get no credits on BOINCstats fpr milkyway WU. What can i do ? Message 68382 - Posted: 24 Mar 2019, 18:20:07 UTC - in response to Message 68381. I just checked your account and it seems your last tasks are credited correctly. Message 68383 - Posted: 24 Mar 2019, 18:46:05 UTC - in response to Message 68382. Message 68413 - Posted: 27 Mar 2019, 8:48:01 UTC - in response to Message 68383. Message 68414 - Posted: 27 Mar 2019, 8:48:07 UTC - in response to Message 68383.